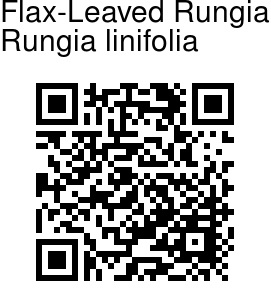 Flax-Leaved Rungia is a small annual herb, growing up to 0.5-1 ft tall. Stems are slender and erect, and branches are threadlike. Oppositely arranged leaves are elliptic-lanceshaped, 1-3 cm long, pointed, with a narrow base. Leaves 4-6 pairs of nerves and are borne on 3 mm long stalks. 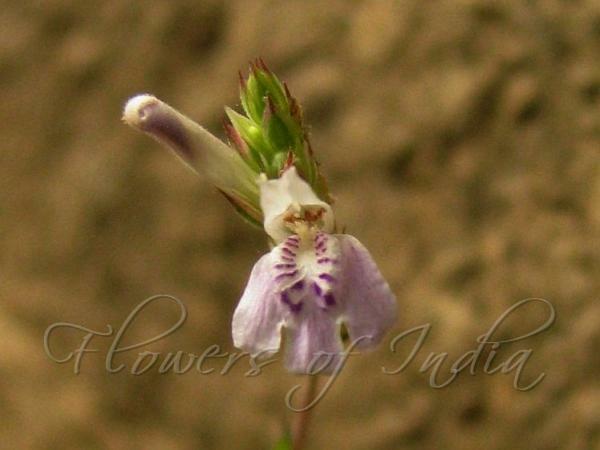 Flowers are borne in narrow spikes, 1-3 cm long, at the end of branches. Flowers are arranged only on one side of the spike. Flowers are pink-purple, two-lipped. Lower lip is 3-lobed, and has purple markings on it. Flowering: December-January. Photographed at Gangawali River near Karikale Village, Karnataka.